Not so long ago I was talking to a friend of mine who said that while he likes indicators in his project plan he just doesn’t have the time to figure out how to make them. So hé why not blog about it because he is probably not the only one that works with project on a day to day basis and want to get something more out of his plan. To start of you need to know about the limitations. 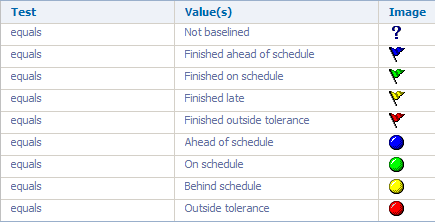 In standard Project Professional you are only able to make two types of indicators. One for Tasks and one for Resources. If you happen to work for a company that has Project Server you are also able to make indicators for Projects. This feature is mostly used to make nice dashboards. In this post I am going to focus on what you can do in Project Professional without a connection to Project Server. Ill discuss and make a indicator for a Task. So how do I make a indicator? When you started up Project Professional go to Project and select Custom Fields. When you click on Custom Field you will be presented by the screen below. In the top you can see which field you are making something for. Default setting is Task but you can also make one for resources. For this exercise I will be using the field Text1. For the indicator I renamed the field Text1 to Progress. When you rename the field Text1 it will be displayed like this Text1 (Progress). In essence this will mean that for Project the field Text1 is still there but will display a different name. The above formula basically does the following: When no Baseline is set it will display “No Baseline”, if a baseline is set and the finish date of the task and the finish date of the baseline is on time with a slack of 5 days it will display the text green. If the task finish date is later then 5 days with a slack to 10 days it will display the text yellow. If it is later then 10 days it will display the text Red. The reason behind this formula is that I don’t want to have a yellow or red smiley if I am one day late on my task. Because that is not a good representation of the project. To make indicators I am going to map the text output to a Indicator. No Baseline equals a question mark. Green equals a green smiley. Yellow equals a Yellow smiley and Red equals a Red smiley. The next thing you need to do is add the new field to your view. In Practice makes Perfect Part 3 – Views I showed how to do this. However in this post I will just add the column to the default view. 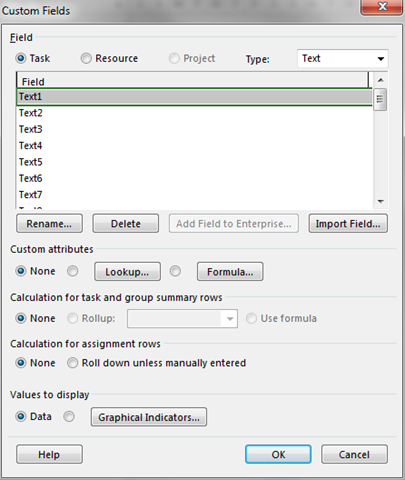 To add the field to the view you need to insert a new column. Be aware that you need to add the column Text1 instead of whatever name you gave to your field. When done it will look something like this. As you can see I didn’t set a baseline yet for this project plan. Let’s change that shall we. As you can see, after I changed my baseline and modified some days all indicator come out nicely. This is just one indicator but depending on your needs you can make a few more. If you also seen Practice makes Perfect Part 3 – Views and know how to build a view you can actually make a dashboard with multiple indicators. This you could use to show management for example. So it is easy to create indicators? The hardest part of making a indicator is deciding what you want to see. After you decided what do see you have to make the formula. For more then one Project Manager this will be difficult. My advice is to ask around your own department or IT department that knows something about scripting or programming (it is really easy for them). You can also look onto the internet their is a lot information about formula’s and how to create them. 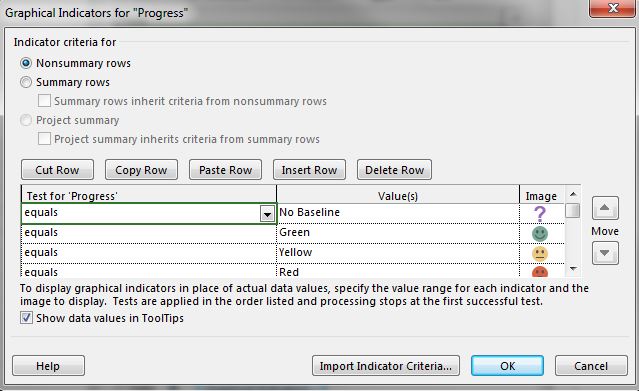 I hope this post gives a little insight on how to create a indicators for your project. It can be really useful like said for a dashboard or to give a overall indications on your project.